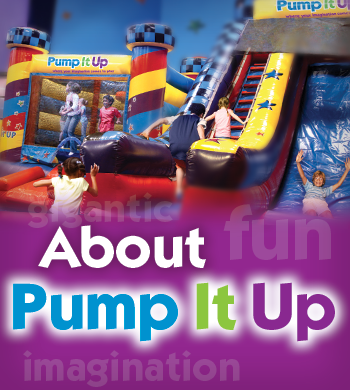 Pump It Up of Schaumburg is located at 1230 North Roselle Road. We are located just north of Golf Road on the west side of the street, directly across from Babies R' Us, in back of Tresure Hunt. Parking is available on the side of our building. Addtional parking is avaialble on our lower level behind Explosive Speed Gym. I-90 West Kennedy Expressway(Rockford) merge lef, Exit 43B I-90 West O'Hare-Rockford: take Roselle Road exit; turn left onto Roselle Road; Pump It Up 1 mile south on the west side of Roselle Road, directly across from Babies R' Us. I-294 North Wisconsin 19 miles to I-290 West Rockford; exit Higgins Road/IL-72 Exit 1B; turn left onto Higgens Road West 3 miles; turn right onto N. Roselle Road; Pump It Up .3 miles north on the west side of Roselle Road, directly across from Babies R' Us. I-355 Northwest Suburbs;exitHiggens Rd/IL-72 Exit 1B; turn left onto Higgens Road West 3 miles; turn right onto N. Roselle Road; Pump It Up .3 miles north on the west side of Roselle Road, directly across from Babies R' Us. IL-53 South 6 miles; exit I-90 West Jane Adams Memorial Tollway Rockford; take Roselle Road exit; turn left on Roselle Road; Pump It Up 1 mile south on the west sideof Roselle Rdoad, directly across from Babies R' Us. IL-58(Golf Rd) East 8 miles; turn leftonto Roselle Road; Pump It Up on the westside of Roselle Road, directly across from Babies R' Us. I-90 East Jane Adams Memorial Tollway Chicago; exit IL-59; turn rightonto IL-59; turn right onto W/Higgens Road/IL-72 East; turn slight left onto IL-58/West Gold Road; turn left onto N Roselle Road; Pump It Up on the west sideof Roselle Roa, directly across from Babies R' Us. I-88 East Ronald Reagan Memorial Tollway Chicago; exit I-355 NorthNorthwest Suburbs; exit Higgens Road/IL-72 Exit 1B;turn left onto Higgens Road West 3 miles; turn right onto N. Roselle Road; Pump It Up .3 miles north on the west side of Roselle Road, directly across from Babies R Us. Check out what parets are saying about us? Thank you to all our wonderful customers. We really appericate your kind words. Their job is to make sure you and your kids and your guests, have a great party experience, have fun, and stay safe while at Pump It Up of Schaumburg. Our friendly, trained staff is here to help make your party the easiest ever. Over half of our staff has been making your parties the best at Schaumburg for many years. Our staff is all new & improved with extensive training to make sure your party is top notch! Customer Service & Customer Satifsfaction is our top priority, so all of our staff conducts in training every 30 days. We take care of all your party needs. All you need to bring is your cake and the guest of honor. Your party experience is stress free, and full of great customer service, to make sure you and your children are top priority. There is free on-site parking and more additonal parking available in the lower level by Explosive Speed Gym. Birthday Party Event Hosts, receive a special parking spot right in front of building enterance. Infant Chaning Areas are located in both men and women restrooms. Strollers are welcome. If you need assistance with your stroller, please see the front desk. Our entrance is stroller-friendly. Water fountains are located near the restrooms, Arena A, and Arena B. Hand Santizer is located in every area throughout the facility. There is free wifi available throughout the whole facility. Ask a staff member for assistance for log in information. Parents can enjoy Pump It Up too besides the inflatable! 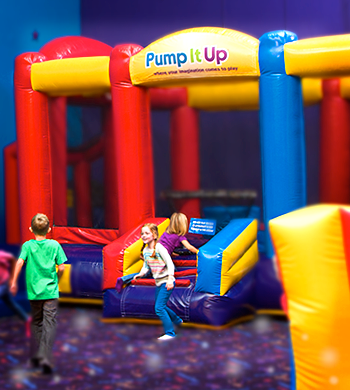 -Offer a variety of snacks and refreshments to keep you PUMPED UP at Pump It Up! 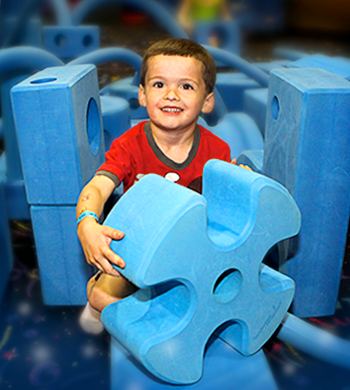 Pump It Up of Schaumburg is happy to support non-profit organizations. We have donated over $100,000 to local non-profits. We try to make every donation possible. But please keep in mind, that sending a donation request does not gaurantee a donation from Pump It Up. If your organization has a donation request, please send it to denidpiu@hotmail.com. In the subject line, put Donation Request. Along with the e-mail, please attach your 501(c)(3) Tax Exempt Letter. 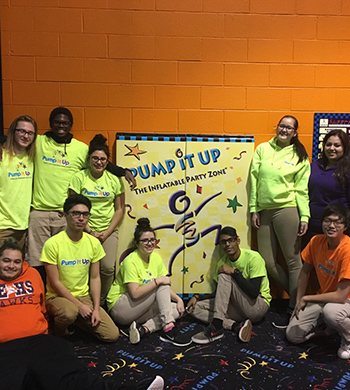 Thank you for thinking of Pump It Up of Schaumburg and we wish your event much success!